Bellini painted this portrait of the Doge Leonardo Loredan in the last 15 years of his illustrious life, making it a representative of his later art style - encapsulating his propensity for explicit realism, life-long learning and emotion. The colors in this portrait represent the Doge's power and his duty to uphold the Venetian Republic. The gold and silver threads of his cape and corno reflect not only light, but the wealth of Venice and the hope that she will continue to prosper. The cerulean background not only creates an eye-pleasing contrast between the golden robes and the golden-orange band of the corno, but also conjures thoughts of the Adriatic Sea and Venice's reputation as a seafaring trading power. 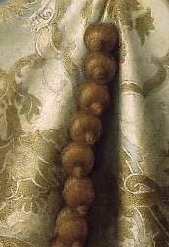 In order to enhance the Doge's robes a step further, Bellini employed the impasto technique, which involves spreading the paint thickly on a canvas to create a subtle three-dimensional effect. With impasto, an otherwise flat painting would be given more dimension and interest. When paired with Bellini's already life-like images, impasto serves to make details, such as the fabric of the Doge's clothing, pop effortlessly off the canvas. Impasto creates hills and valleys on a painting that allows light to bounce off in multiple directions, creating actual shadows on top of the painted ones. Bellini would have taken on the dual role of painter and sculptor when creating Doge Leonardo Loredan. Up until the Renaissance, the art of portraiture was typically meant to capture the sitter's position in life and would have been done while the sitter (who was usually male) was wearing clothing or holding an object representative of his station. Such portraits were usually of wealthy noblemen or statesmen. In these respects, the Doge's portrait is highly typical - he was a newly-elected Head of State wearing symbolic and ornate garments. Older style portraits were also not unconcerned with portraying the emotion or feeling sitters might have possessed, since that was not the point of the portrait. But, as Renaissance ideals of the individual and his or her inner self spread, they soon began to seep into portraiture, where painters sought to capture a piece of the sitter's personality in paint. Bellini was quick to join this movement, painting Doge Leonardo Loredan with him in mind. What did the Doge want to convey? What emotions might he express to elicit certain feelings in those who saw his portrait? Throughout his career, Bellini had been skilled at painting faces with hints of emotion, enough to convey serious ideas to those viewing the paintings. The Doge's portrait is no different. What is often described by critics as a "steely gaze" peering out from under the corno was no doubt painted that way on purpose. The Doge and Bellini could have worked together to determine exactly what kind of sentiments they wanted this portrait to evoke and what this image seems to say through that steely gaze is that the Doge will aim to be a wise and powerful leader of Venice. But, just beneath those eyes - which are not furrowed or squinting in a challenging or belligerent way - is a mouth with the subtlest hint of a smile. This smile could be the Doge's (and Bellini's) way of expressing that Leonardo Loredan yearns to be a trusted, well-liked and well-respected man who may or may not possess a refreshing sense of humor. Upon first glance, Bellini's portrait of the Doge might look like just any other painting of a man. But for those who look further it is an intricate maze of textures and patterns, almost sure to delight. Bellini helped usher in the world-renowned Venetian style, which is categorized as a preference for things of the senses - bewitching details, soft light and images so real they could sing at any moment. Doge Leonardo Loredan is one of the finest examples of the Venetian style of portraiture thanks to the attention Bellini has taken to replicate the details of the Doge's vestments. The Doge is wearing a brocaded damask cape and a corno - the traditional horn-shaped hat of the Venetian Doges. 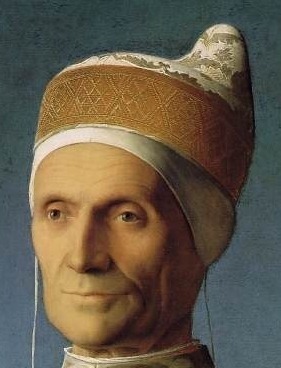 The corno is worn on top of a thin linen cap, which is the source of the tendrils of fabric cascading from the Doge's head to his shoulders. His cape is secured with a vertical cluster of spherical buttons called Companoni. Outside the scope of this portrait would be the long-sleeved robes known as Vesta over which the ornate cape would have been worn. 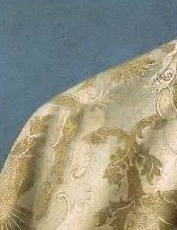 The pattern on the Doge's cape features the symbolic pomegranate, woven in gold and silver thread. Pomegranates were a well-known symbol widely used throughout the fifteenth and sixteenth centuries, with both religious and secular connotations. The fruit itself has a ring of spikes around the top, evocative of a crown - a crown for the head of state or Jesus Christ's crown of thorns. The pomegranate also symbolizes rebirth and fertility and was commonly paired with images of the Virgin Mary, but when paired with a new Doge, the implication was that this would be a new and prosperous era for Venice. Giovanni Bellini was able to precisely render the robe so that it looked like actual fabric had been placed on the canvas. He would have had to combine an entire lifetime's worth of knowledge of perspective, light and color to achieve such an effect.